Journalist: One of the main players is the United States, and Trump made his meeting in Singapore with Kim. Recently, Iran told that we will never meet with Trump because Kim is not Muslim; he doesn’t understand what’s going on, we will never talk to Trump ever. Will you, if it will be necessary, meet Trump directly or indirectly? Do you think it’s necessary for you to talk to Trump? Journalist: Every time I’m thinking about Syria, I remember that you’re a doctor by career, that you lived in London for a long time, you’ve been integrated into that society, and now that society considers you as a, like, a symbol of evil on the earth, and everyone tells there – like in the newspapers and politicians – that you poison people with chemical weapons, you do all these awful stuff to your own citizens. How do you feel about this, or does it make any pressure for you emotionally, and to you and to your family? How you explain to them what’s going on? Journalist: And the last question probably is that every time we come to Western Ghouta, we see the signs left by ISIS or al-Nusra: “we will return.” For us, it’s scary, because we spent a lot of money, we lost a lot of lives supporting Syria in her struggle with the “caliphate.” So, for us, it’s scary that one day it can return. What’s your estimation? Journalist: How you can stop the occupation in northern Syria because of this agreement between America and Turkey, one which is Syrian soil? [...] Journalist: What do you expect from Russia in this case? Because you have so many players whom you told should all leave Syria, you told that the Syrian nation one day will ask everybody to leave this ground. What do you expect Russia in this case? Because we are allies, we are friends. Journalist: I’ve been to Eastern Ghouta and I’ve seen how strongly it’s destroyed, how hard it’s destroyed, and as far as I know, you need 400 billion Dollars to rebuild the country, but the West tells that they will not give a dime while you are in power. What can you do in this situation, because you have to rebuild the whole country? Journalist: When we’re talking about the restoration of the whole country, it means the restoration of trust and friendship between people, because we can see this partly as a civil war when the brother shoots the brother, because of the different religious or any other views. In this case, you start with constitutional committee. The opposition made their list for constitutional committee. Will you run for the next presidential term, or how to restore this political structure of your country? The 2018 FIFA World Cup is in full swing and its group stage is coming to a close. We are all following it closely and are primarily interested in good play. I don’t think it makes sense questioning how the teams, coaches and the people who are organising their work and stay have assessed what they have seen in Russia. I think you have seen the many posts on this subject in social media. Now the dominant topic is how people in Russia are receiving their guests, doing this in the Russian tradition with an open heart and mind. This is quite surprising. We did not even expect such a response from ourselves. Of course, we note that the overwhelming majority of foreign media do not hesitate to publish objective articles on sports that really describe what is happening at the World Cup in Moscow, St Petersburg, Yekaterinburg and other cities that are hosting this celebration of sport. We are glad to note that the success of the World Cup in Russia is acknowledged even by those who were dubious about this event and Russia in general. Recently Lithuanian Foreign Minister Linas Linkevicius admitted that he does not see any effect from the idea of Ukrainian Minister for Sport Igor Zhdanov to boycott the World Cup that was supported by British Foreign Secretary Boris Johnson and the authorities of some other countries. As we said, reality is the best argument in countering propaganda and the tendency to engage in wishful thinking. Here is the answer to the issue of Russia’s isolation. Do not listen to those who claim that Russia is isolated. They are lying. They wanted to isolate it but failed. The main thing that we are seeing today is the division of people into those who wanted and are still trying to isolate it and normal ordinary people all over the world who have their own political views and preferences and who understand that such notions as “peace,” “neighbourliness” and “sport for the sake of peace” are above any attempts to politicise these issues. Surprisingly, those who came to us before could understand the difference between the truth and lies because they had what to compare them with. Despite the intimidation the media have still arrived here and see with their own eyes what is happening. As you know, official delegations and representatives of the political establishment of different countries are coming here. For example, there is Princess Hisako Takamado, who had never visited Russia before coming for the World Cup. The Australian newspaper Sydney Morning Herald wrote that she was the first member of the Japanese Imperial Family to visit Russia and quotes her as saying that it was a great honour for her. We are glad that this information is read by people in foreign countries. The media of the Baltic countries that initially wrote, to our great regret, that nothing will come of this event and there is no point attending because Russians mess up everything, are now writing in a friendly tone. In brief, we are witnessing the victory of reality over artificial stereotypes that are really being ingrained into the minds of philistines. Correspondent Oliver Carroll from The Independent, a British newspaper, begins his article about “English fans fraternising with Russians” and gives historical insight into bilateral relations. There are many such pieces in Europe, Asia and Africa. The British newspaper The Daily Telegraph wrote that England’s match in Volgograd was “perhaps the friendliest of tournament football matches.” It is very important because Great Britain tried to scare football fans and hooligans with the spectre of Russian aggression. You can remember the horrible and scandalous BBC films released a year and a half ago: British fans cannot go because they will allegedly get beaten. In his interview with the Belfast Telegraph British fan Billy Grant said that he was still a little nervous when he departed the plane, but when he got to the city and took a walk around the fan zone, people hugged him and took pictures with him. “I would say to everybody – don’t believe what you read, come out and see it for yourselves.” His colleague, when answering the question whether they believed negative stories about Russia, said he had seen everything with his own eyes and did not believe them anymore. 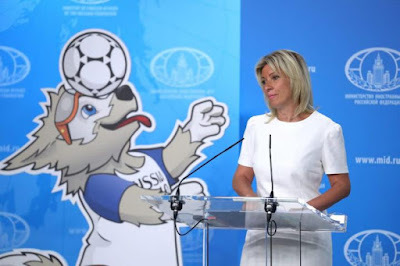 The Norwegian newspaper Dagbladet notes that Russia was at its best in organising the World Cup and people the newspaper’s correspondent spoke to were surprised that there was no violence or disorder during the World Cup. Unfortunately, the traditional negativity is still here. The US newspaper the Wall Street Journal has published a piece in which correspondent Joshua Robinson writes that Russia’s “breathless” victories over its first two opponents “have raised plenty of questions” due to the doping scandals in Sochi. Who exactly has raised them and what questions are these? We have already published an article on this topic. I would like to repeat that we call on those in doubt to read the conclusion of the anti-doping commission and the FIFA press service’s statement that says the investigation of Russian footballers on the World Cup preliminary list are over and all cases are closed. In addition to biased and propagandistic information, there are outright fakes. Apparently it is difficult to believe that Russia is not the barbaric country they wrote about, so western media descend to fakes. A photo with dozens of dog carcasses was posted in social networks. Of course, it was said to be an illustration for the World Cup in Russia. Later it turned out that the picture was not taken in Russia but in Pakistan. The picture’s author, Reuters photographer Akhtar Soomro, was also found. The photo was taken in Karachi on August 4, 2016. The original picture was restored. It is clear the picture was not taken in Russia, but unfortunately agencies started to use it: in particular, AFP posted it alongside text on the situation in Russia on the eve of the 2018 FIFA World Cup. Unfortunately, it came to outright fakes. More false information came from CNN. Allegedly Mohamed Salah, forward of Egypt’s team and English club Liverpool, “is considering quitting the Egyptian national team due to his unhappiness over what has happened in Chechnya.” There should have been an official statement of the team with a direct quote from the footballer before publishing this on television. The press service of the Egyptian Football Federation said it has no information about Salah’s intention to quit. Such dirty tricks are also used. We have heard a lot about Russia planning to use upcoming sports competitions for political purposes. We can see how, unfortunately, this sporting event is being used for political purposes in other countries. There are indeed many examples. We always emphasise that sport lies outside politics and politicisation actually kills sporting events and hurts the athletes. I cannot help saying the following. We were simply shocked by the Freedom of the Media OSCE event in Kiev that somehow ended up being linked with the World Cup. Are there any problems with the accreditation of journalists or any cases of non-admission to events? As far as I know, everything is transparent, clear and logically organised. Most importantly, we have not heard any complaints from journalists. How it is possible to link these two things is completely incomprehensible. The German media outdid everyone else in politicising the FIFA World Cup. Let them forgive me, this is just impossible to read. Every day for the past few weeks, they have been issuing endless calls for their political leadership and politicians, and the general public to not travel to Russia. Day after day, the same materials in German. I do not know who they are targeting; hardly a Russian audience; maybe the German players. Maybe the German national team, having read the calls to political figures to not attend the matches, took this as an instruction. Now there is an actual reason to not go to Russia – there is nothing more to see. But this is just an assumption. After the game with Spain, the Moroccan goalkeeper, Yassine Bounou, said that Russia had good stadiums, friendly people and very beautiful cities. And the Nigerian national team’s midfielder, John Obi Mikel, who has worked wonders during this tournament, gave journalists the following comment: “We are treated very well in Russia, everyone supports us, and there are no manifestations of racism. It's even amazing how much we are supported here.” This, despite the fact that racism and the football fans were highlighted in many Western media publications, which discouraged people from coming to Russia. We will continue to follow this subject and support the players, and most of all support good, high-quality and beautiful football, and the Russian national team. On July 4, Minister of Foreign Affairs and Expatriates of the Hashemite Kingdom of Jordan Ayman Safadi is expected to come to Russia on a working visit. Ayman Safadi will meet with Foreign Minister Sergey Lavrov to exchange opinions on current international and regional issues, primarily a settlement in Syria in the context of a de-escalation zone created by Russia, the United States and Jordan, as well as developments on the Palestinian-Israeli track. The ministers will also discuss the further development of bilateral cooperation. Russian-Jordanian dialogue is noted for the high level of mutual trust and the close or identical views held by the two sides on many key international and regional issues. The situation in Syria remains complicated. The unwillingness of the radical Syrian opposition and its sponsors to take any reciprocal steps towards peace and a political settlement based on UN Security Council Resolution 2254 has invigorated the remaining terrorist groups. Jabhat al-Nusra and diehard ISIS terrorists are making use of the power vacuum in the regions that are not controlled by the Syrian Government to build up their combat capability and have staged new provocations. Regrettably, this also describes the situation in the southern de-escalation zone, which was created under trilateral agreements between Russia, the United States and Jordan and approved in the November 11, 2017 statement by the presidents of Russia and the United States and the decisions adopted in the Astana format. Contrary to their obligations, our partners have not managed to convince the armed opposition to comply with the ceasefire regime and are not fighting extremist groups, such as ISIS, Jabhat al-Nusra/al Qaeda, as well as other groups that have been designated by the UN Security Council as terrorist. Ultimately, this has prevented the attainment of the stated goal of removing foreign terrorist fighters from the de-escalation zone. Instead of gradually reintegrating the de-escalation zone into the national territory within the framework of efforts to maintain Syria’s unity and sovereignty, continued efforts were taken to separate the southwestern region from the rest of the country. The Syrian Government has not regained control of border checkpoints, and the Syrian-Jordanian border has not opened to commercial and civilian cargoes, contrary to the provisions of the Russian-US-Jordanian Memorandum of Principles concluded on November 8, 2017. Instead, missile and artillery shelling was launched from the de-escalation zone at Daraa and Suwayda, in which civilians have been killed. On June 24, the Syrian Government forces launched an offensive in southwestern Syria to eradicate the terrorists and restore the country’s integrity. By June 25, the Syrian Army liberated the Lajat Plateau and a large town of Bosr al-Harir in the Daraa Province from the al-Nusra groups and forced ISIS units to leave the villages of Qus Abu Jabal and Tell Mughir in the east of the neighbouring Suwayda Province. It is notable that a large part of local armed groups, outraged by the harassment of local residents by al-Nusra fighters, have gone over to the Syrian Army. Russian servicemen from the Centre for Reconciliation in Syria are doing all they can to help negotiate ceasefire agreements between the Syrian Government and armed opposition groups who are not cooperating with terrorists. Russia has not withdrawn from the memorandums on the de-escalation zone in southwestern Syria, which it signed with the United States and Jordan on July 7, 2017 and November 8, 2017. We reaffirm the need to comply with the provisions of these memorandums, in particular, on fighting Jabhat al-Nusra and ISIS terrorists and eradicating their presence in the de-escalation zone. What the Syrian Army supported by Russia’s Aerospace Forces are doing now should have been done long ago by our American partners. At the same time, a recent decision by the US administration to allocate an additional $6.6 million to finance the operation of the so-called White Helmets in Syria has set us thinking whether Washington really wants to see an early settlement and stabilisation and the eradication of terrorism in Syria. A great deal has been said about the questionable activities of the White Helmets, who are directly involved in the Western information war against Syria, in particular the staging of chemical attacks. In fact, the United States and the US-led coalition continue to support the stooges who are acting in collusion with terrorists. I want to speak on another painful problem in the drawn-out Syrian crisis – refugees and internally displaced persons. To resolve this problem, in addition to ensuring a high level of security the country must rebuild vital economic and social facilities. Refugees cannot return home if there is no electricity or water, no regular supplies of food and basic necessities, and no schools or medical facilities. The main thing is to create jobs so that people will be able to feed their families and bring up their children. Russian servicemen continue to clear explosive devices from the liberated populated areas. Their work is a major contribution to creating conditions for a voluntary, safe and dignified return of thousands upon thousands of Syrians to their homes. We welcome any international initiatives aimed at providing assistance to Syria and the Syrian people and promoting an early settlement of the situation in Syria on a solid basis of international law, primarily UN Security Council Resolution 2254. On May 29, the Russian Consulate General in Erbil managed to repatriate Russian minors, namely, Sofia Galidova (born December 15, 2013) and Salma Galidova (born July 15, 2015), with the assistance of authorities in the Kurdistan Region of Iraq. Their father, Russian citizen Gajimurad Galidov (born August 21, 1990) and mother, a citizen of Azerbaijan T. Guseinova (born February 1, 1993), are staying at a pretrial detention centre of the counter-terrorism service in the Kurdistan Region of Iraq. The authorities are investigating their alleged complicity in ISIS terrorist activities. Their mother has decided to keep the third child, G. Gajimuradovich (born March 6, 2018), a Russian citizen, with her. The parents of Gajimurad Galidov repatriated the Galidov sisters from Iraqi Kurdistan, with the Russian Consulate General assisting them after their arrival in Erbil and their subsequent stay there. According to local authorities, G Gajimuradovich is currently the only Russian minor staying with his parents at a detention centre in the Kurdistan Region of Iraq. The Russian Foreign Ministry continues to closely follow the situation concerning presumed Russian citizens who surfaced on previously ISIS-controlled territories in Iraq via the Russian Embassy in Baghdad and the Russian Consulate General in Erbil. We are doing everything possible to verify their Russian citizenship, to objectively review their cases as well as to eventually ensure their repatriation. Day after day, we can see how representatives of the Western community are exterminating the international legal foundations of our world’s existence, while claiming that they are preserving and upholding them. We commented the other day on the situation concerning the withdrawal of the United States from the UN Human Rights Council. We did not consider this matter to be something new or unexpected. We noted that, unfortunately, the United States was regularly dealing blows against the UN Human Rights Council as well as UNESCO. This comes as another salvo against international organisations of the UN family and the entire system of international law. On June 27, a special session of the Conference of the States Parties to the Convention on the Prohibition of the Development, Production, Stockpiling and Use of Chemical Weapons and on their Destruction (Chemical Weapons Convention), convened on the initiative of several Western countries headed by the United Kingdom, ended in The Hague. By resorting to political manipulations and directly bribing a number of delegations and resorting to open blackmail, London and other parties allegedly advocating efforts to consolidate the Chemical Weapons Convention have managed to railroad their odious draft resolution vesting the OPCW’s Technical Secretariat with powers that are not within its purview, i.e., allowing it to determine those guilty of using chemical weapons in Syria. Moreover, the very same document instructs the Director-General of the OPCW’s Technical Secretariat to submit proposals for the establishment of a similar investigative mechanism to provide technical assistance to other states, parties to the Chemical Weapons Convention, at their request, in exposing perpetrators, masterminds and sponsors of using chemical agents as weapons on specific national territories. These proposals are to be approved at a regular session of the Conference in November 2018. We consider this resolution to be illegitimate. We have to state openly that the Conference of States Parties to the Chemical Weapons Convention, has transcended its mandate, while approving this document. Russia which co-founded the OPCW and which decided to join the Convention was a member of an entirely different Organisation. The OPCW was clearly expected to provide technical assistance to national programmes for eliminating chemical weapons. A mechanism stipulating, if necessary, amendments to specific aspects of its activities suited everyone. One should not forget that the OPCW’s subject matter and goals include efforts to abstain from developing, manufacturing, stockpiling, preserving and using chemical weapons, as well as inciting or encouraging anyone to engage in such activities. The Convention's Article I contains an exhaustive list of methods to implement the above-mentioned obligations by conscientiously fulfilling a number of purely technical measures that aim to eliminate chemical weapons, as well as CW production and storage facilities, and to refrain from using chemical agents for riot control purposes and also in warfare. The OPCW plays a purely applied role in providing the states, parties to the Chemical Weapons Convention, with technical and expert assistance to accomplish the above-mentioned tasks and to conduct verification procedures. Therefore the Convention contains no provisions implying the possibility of establishing a special mechanism to expose those guilty of using chemical weapons. We believe that it is a priori impossible to vest the OPCW’s Technical Secretariat with such powers without analysing the Convention itself and without amending it under a procedure stipulated by Article XV. Being aware of the futility of any attempts to legally approve these amendments that essentially encroach on the authority of the UN Security Council, the United Kingdom and countries solidarising with it have resorted to outright forgery and have cynically substituted the OPCW’s genuine goals and tasks by railroading an illegitimate resolution of the Conference of States Parties to the Chemical Weapons Convention. At the same time, they hypocritically overlook the fact that one of the Convention’s main goals, namely, the complete elimination of chemical weapons, has not been achieved so far. They are painstakingly hushing up the fact that a Western country boasting the most powerful chemical weapons arsenal and constantly putting off its elimination deadlines continues to violate its obligations under the Convention. The initiators of this illegitimate decision are diverting attention to a completely different task, namely, determining the culprits of alleged chemical incidents. They have forced 82 countries to vote for the British draft document using unscrupulous methods, and now they will try to impose their harmful opinion on the remaining 111 states, conscientious members of the OPCW. We are confident that this obvious abuse of procedural regulations, the undermining of the spirit of consensus which is a salient feature of global disarmament and non-proliferation mechanisms and disdain for the position of all other states, parties to the OPCW, having equal rights aggravates divisions within the OPCW, threatens the Convention’s integrity and the very preservation of the global regime of chemical disarmament and non-proliferation of chemical weapons. We would like to thank all states that have resolutely stood up in defence of international law and fundamental principles of interstate relations on a par with the Russian Federation and voted against the odious British-sponsored draft resolution of the Conference of the States Parties to the Chemical Weapons Conference, whose consequences all of us will now have to overcome. This is not the first time that our American colleagues have turned a situation upside down. However, the forms and methods involved are becoming increasingly vulgar and offensive. Taking into account the sensitive nature of the issues discussed, the counter-terrorist international conference was originally planned as exclusively a forum of official representatives of member states, heads of counter-terrorism agencies. The format in which the Conference was eventually organised provides for the heads of counter-terrorist agencies to meet behind closed doors on the first day and, starting from the second day, for the discussion to continue with the invited NGOs. Now, as the conference is taking place, the US is, for some reason, making a scandal out of it. The US Ambassador, Nikki Haley, has crossed the line and has no qualms speculating that the decision to deny access to the NGOs was allegedly taken under Russia’s pressure. We regard such statements as unacceptable and false. Unfortunately, the US Ambassador’s behaviour, which seems odd for a diplomat, fits well with the disregard for the UN that is typical of the US delegation, and indicates that the United States is not ready for an equitable dialogue between states. Methods based on diktat, threats and blackmail, financial blackmail included as a new variety, against the UN, which have been increasingly practiced by the US when something goes against its directives, fully contradicts the goals and objectives of the United Nations, its working principles and diplomacy in general. We strongly condemn this provocation aimed at discrediting the first ever UN Conference of Heads of Counter-Terrorism Agencies, held in order to discuss an issue that is of utmost importance to humanity. At a time when the entire world needs to close ranks in the fight against this evil, Washington continues to pursue its narrow self-seeking interests and is eying new geopolitical counterterrorism projects based on double standards. By reducing its participation in the Conference of Heads of Counter-Terrorism Agencies, the United States is challenging the multilateral cooperation against the global terrorist threat as well as individual countries that are involved in an uncompromising struggle against terrorists across the world. We consider the references to the nationality of the Under-Secretary of the United Nations Vladimir Voronkov coming from the US Administration in this situation as yet another accusation and a sign of the Russophobic hysteria that took root in the American political establishment and is assuming ever more radical and paradoxical forms. I would like to say that excesses like this will not fail to prompt a response they deserve and will be taken into account in our further work. Despite Britain’s stubborn unwillingness to contact Russian representatives on matters related to the investigation into the Salisbury case and considering the unflagging concern in Russia over the state of the health and status of the two Russians who have found themselves involved in this frightening intrigue and provocation, we persistently continue to press for the clarification of all aspects of the situation and for obtaining consular access to Sergey and Yulia Skripal. We are not satisfied with the formal correspondence from the UK Foreign Office in response to our requests. We view London’s policy to unilaterally investigate the incident ignoring proposals for joint work as extremely unconstructive. I would like to stress once again that the UK has rejected cooperation and interaction with Russia in this case, although assistance in the form of official requests did come repeatedly via diplomatic channels. This British approach, including the purposeful misleading of the public with regard to what has happened in Salisbury, certainly the use of censorship to manage the interpretations of this subject in the information space, and the effort to coerce the UK law enforcers into operating within the prescribed political framework, is evidence of the political pressure brought to bear on the investigation by the UK authorities. London seems to expect the investigators to do nothing but legitimise its absurd accusations against Russia. Incredibly, the investigation does not even have a list of suspects three-odd months on after the incident! Not so very long ago, the Prince of Wales and the Duchess of Cornwall visited Salisbury to see how life there was getting back to normal (to reiterate, London told us that the case in point was the use of chemical warfare agents), how life in Salisbury was being normalised after the use of what London thought were chemical warfare agents. We have just one question in this connection: Have the Skripals been shown to the members of the Royal Family? They should have done this for the Prince of Wales. The so-called “Skripal case” is veiled in mystery in the best traditions of British detective story-writing. The developments surrounding it are so absurd that even Britain’s allies are increasingly skeptical and doubtful as to the veracity and objectivity of its anti-Russia insinuations. Its partners, including those in G7 and the EU, who never got around to making head or tail of what had happened and took London’s word for it, have failed to receive any proof aside from the very same words that we all heard: “highly likely” and “there is no other plausible explanation than Russia’s responsibility.” I learned from my reading of medieval history that the explanation was the same, when they were dragging women, scholars, or doctors to the fire and the onlookers inquired what for. There is just no other plausible explanation than that they are “sorcerers” or “witches.” It is medieval rhetoric! The Middle Ages excelled in the development of culture and architecture but also stood out as an example of total ignorance, illiteracy and, most importantly, frenzied struggle against what was beyond them to explain. Let me remind you that former MI5 officer Annie Machon told Talk Radio that the Russian Federation had no motive for persecuting Sergey Skripal after he was extradited to Britain, given that he was arrested back in 2006 and actively cooperated with the investigation. Ms Machon also noted that deeper motivations could be at play in the so-called “Skripal case” and that the incident was likely to be used to discredit Russia. We were saying as much. The most interesting thing is that after we or experts on Russian television said this, the British made special selections from the content and used them for accusing Russia of spreading disinformation. Now the British themselves and the British media are saying so. Regrettably, the Western official circles are still pushing their narrative and speaking about solidarity. What solidarity? Solidarising the Medieval way in accusations with regard to what you cannot explain? On June 19, NATO Secretary-General Jens Stoltenberg said in his Guardian article that Russia “seems to have no qualms about using military-grade nerve agents on our streets.” I would like to remind Mr Stoltenberg that, firstly, the investigation is still in progress and that all his statements are based solely on the UK’s political declarations, and, secondly, a man who heads the North Atlantic alliance rather than a macramé fans society should know better and realise what would have happened on their streets if military-grade nerve agents and, as London claims, chemical warfare agents had been really used there. This is what London says and what the NATO countries, among others, have solidarised with. Given the total lack of concrete evidence, the statements of the sort that were made by NATO Secretary-General Jens Stoltenberg are not only unprofessional insofar as they are ungrounded but are also dangerous because they feed the destructive Russophobic sentiments and are not conducive to the start of constructive cooperation in addressing a huge number of really important international problems. We were greatly amazed to learn that President of the World Anti-Doping Agency (WADA) Craig Reedie was awarded the Knight Grand Cross of the Order of the British Empire. Established on November 10, 1999 by the International Olympic Committee and national governments, and headquartered in Lausanne, Switzerland, WADA claims to be an “independent international” organisation. The presentation of the title to the head of this allegedly independent agency by the leaders of a country is questionable from a moral perspective. It is not the award in itself that poses a problem. In fact, it is not uncommon for representatives of one country to decorate people from another country for their contribution to promoting bilateral affairs, humanitarian relations, culture, art, economic or financial ties. But this is a whole different story. It is said that Craig Reedie received this high accolade for his services to sports, while it is well known that this order of chivalry has a motto “For God and the Empire” and rewards contributions to upholding the United Kingdom’s interests. As for the sports thing itself, it was the WADA leadership who were behind the groundless doping scandals that were engineered to prevent Russian athletes and Paralympians from competing in major international events. One could hardly imagine a way to inflict greater damage to international sports. Unfortunately, all we can do is put on record that Craig Reedie, who believes that “sports without politics, it’s sort of an impossible dream,” did nothing to strengthen the Olympic movement. It is equally unfortunate that his leadership resulted in sports becoming increasingly politicised. We have never seen so much politics in sports. Yes, there were attempts of this kind in the past, but never such a heavy blow was dealt to international sports. Russia firmly opposes manipulations in sports, and is committed to the principle of “sports outside politics” and the rules of “fair play”. We took note of Ukraine’s recent confrontational statements regarding the Nord Stream 2 project. In our opinion, they are beyond the reach of decency or rationality. Perorations that the project is a threat for Ukraine prove yet again the opponents of Nord Stream 2, not Russia, seek to make a political matter out of it. Let me remind you some basic facts. Nord Stream 2 was traced under the Baltic Sea which makes it 2,000 kilometres shorter compared to gas transits through Ukraine. Accordingly, the cost of supplying gas through Nord Stream 2 would be far below the current tariffs for Ukraine transits. Nord Stream 2 promises of efficiency and uses cutting-edge technology, which differentiates it from Ukraine’s gas pipeline system in so many ways. The construction of two additional natural gas pipelines under the Baltic Sea will diversify deliveries to European consumers. This would strengthen Europe’s energy security, where demand for gas is expected to increase in the years to come, instead of undermining it. Russia has stated time and again that Nord Stream 2 was a business project and nothing else, which does not mean that any other oil and gas transit routes would be abandoned. This is a question of their economic viability as well as reliability. At the same time, Kiev’s statements and actions cast serious doubt on the possibility of reliably supplying natural gas from Russia to European markets through Ukraine. I noticed that these statements by Ukraine were immediately echoed in Washington, in what could be viewed as twin statements, which makes it clear who is behind the developments in Kiev. Ukraine really needs Washington’s opinion even when it comes to European affairs. On June 22, the Day of Memory and Sorrow, President of Ukraine Petr Poroshenko extended anti-Russian sanctions to include a number of veteran organisations such as the Combat Brotherhood and the Russian Union of Afghan War Veterans. The purpose of the new sanctions is to restrict the activities of these NGOs in Ukraine by freezing their assets, revoking licenses and using other mechanisms to put financial pressure on these organisations. It should be noted, that these NGOs have played an active role in providing humanitarian assistance to the people of Donbass. From the outset of the conflict in southeastern Ukraine, the Combat Brotherhood has not only helped collect food but they have also helped to deliver it together with other essentials needed by the elderly and children as well as other vulnerable groups who are particularly susceptible to the negative consequences of the conflict. The Russian Union of Afghan War Veterans has also delivered tons of provisions in the form of aid to youngsters in Donbass. I would like to remind you that over 10,000 people have lost their lives, and hundreds of thousands of Ukrainians have become refugees during the conflict in southeastern Ukraine. We know this only too well here in Russia. The people of Donbass who remain in the places where fighting is going on have been suffering from the terrible consequences of the humanitarian crisis, for which the authorities in Kiev bear the responsibility. Due to the blockade imposed on the region by the Ukrainian security forces, people there are experiencing serious difficulties when it comes to trying to get supplies of food, medicine and basic necessities. Therefore, the activities of these NGOs are very important in terms of alleviating the humanitarian situation in Donbass. In this context, we consider unacceptable and inhuman Ukraine's actions aimed at squeezing out any NGOs, which, unlike the Kiev authorities, do really care about the needs of these Ukrainian citizens. We also note that imposing sanctions on the Day of Memory and Sorrow reflects the desire to alienate the peoples of Russia and Ukraine and is an act of sacrilege against our common history. At the June 15 briefing, we raised the subject concerning propaganda in the German media, in particular, Deutsche Welle. We cited the example of the commercial content distributed by the corporation, which, as users say, is giving it away as news. We also pointed out that Deutsche Welle used commercial promotion tools in the social media to promote their content. I must say that German government-funded Deutsche Welle quickly published a response to the questions we raised at the previous briefing. Only, they have not actually answered our questions, but their own – the answers had nothing to do with the questions that we actually asked. Judging by the statement issued, they did not agree with our assessment of their publications on Twitter as being offensive to Russia. Here is a quote: “The tweet you showed at the last briefing was just a preview of one of the Russian language interviews, nothing more.” This sounded like it was common for regular media to announce their content on social media. We do not dispute the right of the media to publish critical articles about any country, politician, or political party. What we are getting at here is something else. I would like to reiterate that the screenshot of the commercially promoted ad sent to us by one of the users contains not just the facts or the announcement of an event. It incorporates a judgmental appraisal about our country. That is, the money of the Federal Government of Germany is used to distribute a completely inappropriate opinion of our country. At the same time, that tweet did not specify the attitude of Deutsche Welle or the German Federal Government that backs it to this judgment. We are not at all satisfied with what they published in response. We will continue to follow this subject simply as part of our own interest in disinformation and propaganda distributed on social networks. I would not describe it as misinformation; propaganda would be more accurate. That is why on June 18, we posted a message on our Twitter account asking users to share more screenshots of similar Deutsche Welle “announcements” with the #ProplachenDW hashtag. I must say that our tweet caused quite a stir on social networks, as it was seen by more than 100,000 users, and many subscribers sent us screenshots of the commercial tweets from Deutsche Welle. Users openly complain about this German organisation and its advertising, and many even blacklisted DW annoyed by its obtrusive messages. I am grateful to those who openly express their opinion on this matter in social media, because we believe that in this case, the opinion of users is very important. This is not about our politicised assessment, but about an adequate response to what users write to us. Once again, I would like to say that the tweet we showed last time is not unique. We note that, unfortunately, Deutsche Welle is increasingly sliding into propaganda. We have yet another confirmation. Deutsche Welle, which positions itself as a media outlet, is using German taxpayers’ money to make animated cartoons. We do not mind. Then why say they are against propaganda? Producing an animated series, launching it, spending a lot of money on it, and incorporating openly political content and overtones is flagrant propaganda. The German propaganda school has strong historical traditions. Therefore, we will continue to observe this. Frankly, every time you hear the German media say something about the Russian media being propagandists, remember Deutsche Welle. There are more than enough examples. This is their day-to-day activity. What kind of reaction do you think Russia Today would provoke for doing the same thing in German? Do not get me wrong – this satirical show is being produced for the Russian audience with German Government money. And they have the nerve to point a finger at us for some kind of propaganda and interference in internal affairs using propaganda resources. Once again I would like to stress that it is not just some NGO, some alliance of German animators, but it is Deutsche Welle. In 2018, Deutsche Welle will receive an additional EUR14.5 million from the German Federal Government. According to Federal Government Commissioner for Culture and the Media Monika Gruetters, these funds should go to strengthen the broadcasting in Russian, Ukrainian, Arabic and Turkish. That is, there will be more cartoons. Moreover, the website of the Federal Government of Germany has noted that Deutsche Welle is Germany’s overseas broadcaster. That is, a broadcaster financed with public funds, is engaged in pure propaganda and in the commercial promotion of content that is not information but surreptitious propaganda. The website also says that DW’s mission includes “representing Germany as a mature European culture nation and a free democratic rule of law-based state.” This is more than depressing. Once again, I would like to say that from our perspective, all these projects I have already mentioned are flagrant propaganda aimed at a direct impact on the Russian audience by a company financed by the German Government. All of this has nothing to do with journalism. I would like to take this opportunity to induce our colleagues from the Russian State Duma, the Federation Council and the Federal Service for Supervision of Communications, Information Technology and Mass Media (Roskomnadzor), as well as other relevant official agencies and civil society to pay attention to this situation and to give an appropriate assessment, as well as to start analysing this from the point of view of the very standards that German representatives cite when discussing the situation concerning the Russian media. The European Union continues to promote the idea of Internet regulation and the need for measures to counter disinformation and "fake news." At the Vienna conference on Media and Democracy in Europe, European Commissioner for Justice, Consumers, and Gender Equality Vera Jourova said that digital media, social networks, and bloggers are getting increasingly popular with Western audiences. She proposed to apply to them the same rules as to traditional media outlets. A few years ago now Russia made a similar proposal. However, when we said that it was impossible to widely cite social networks without vesting them with the same level of responsibility as traditional media has, we were told that we were suppressing the freedom of the press. Today, this seems to be a European trend. The European Commissioner also proposed amending the EU-wide Code of Practice on Disinformation, which had been presented by the European Commission in April of this year and to increase control over political advertising. Is the Commissioner for Consumers aware of the political advertising on Deutsche Welle? Hopefully, she will be now. These proposals have drawn criticism from the media as well as human rights activists who see a potential threat of censorship in them. It is noteworthy that in denying these allegations Ms Jourova stated that freedom of expression in the EU is not absolute and this, according to her, favourably distinguishes it from the United States. It is symptomatic that when similar initiatives are discussed in Russia, the same European representatives are first to voice their criticism, calling them anti-democratic and restrictive of freedom of speech and expression. However, when similar matters appear on the European Union’s agenda, Brussels changes its attitude to the complete opposite, rejecting any criticism on the part of human rights activists and the media. This is not even double standards but absurd. We call on our European colleagues to stop practicing double standards when talking about the threat of "fake news" and disinformation and not to use the latter as a pretext to restrain the activity of the resources providing an alternative to mainstream media, because this will deal a severe blow to freedom of speech. We are absolutely convinced that such delicate matters that touch upon the interests of civil society, NGOs, and journalists, should be discussed in a transparent manner with the involvement of all interested parties. We continue to expand our presence in social networks. We are doing it not only through official channels but also informally. Taking into account the increasing interest to what is happening in Russia and abroad among young people and the diplomatic community, an Instagram account has been created on behalf of Foreign Minister Sergey Lavrov that will be moderated by the Council of Young Diplomats. We receive lots of questions and requests to post photos. Some official photos are available through the official Flickr and Instagram accounts, and the informal photos that we are so frequently asked for will be posted at @s.v.lavrov page in Instagram. The page is getting increasing more popular. You can also find information about it at the websites of the Council of Young Diplomats. You are welcome to sign up. It will be interesting. I would like to answer several questions we received before this briefing. One of them concerned the possibility of a visit by a US congressional delegation to Russia. I can tell you that a delegation of US Congressmen indeed plans to visit Russia between June 30 and July 5. It is expected to include members of both the Senate and the House of Representatives and will be led by Senator Richard Shelby. The programme of the trip includes visits to St Petersburg and Moscow, as well as meetings at the Federation Council and State Duma of the Russian Federal Assembly (July 3), and with other Russian officials. We will be happy to welcome the delegation at the Foreign Ministry of Russia. We hope that this visit will give a fresh impetus to the resumption of full-scale inter-parliamentary exchanges, which the Congress has suspended. We believe that dialogue between our legislative assemblies can play a positive role in bilateral relations, improve their atmosphere and interaction on various issues. We will later provide additional information on the format of a possible meeting at the Foreign Ministry. Japanese journalists have asked for comments on the possibility of 2+2 format meeting between Russia and Japan. As you know, this format provides for meetings between the foreign and defence ministries of the two countries. The possible date for this meeting is being discussed. This is all I can say at this moment. Prime Minister of Japan Shinzo Abe said at the joint news conference with President Vladimir Putin on May 26 that the third 2+2 format meeting could be held in the second half of the year. I just wanted to remind you of this. We will make public the official date after it has been coordinated. I also received a question about the possible participation of foreign delegations in the 2018 Eastern Economic Forum in Vladivostok. The details of the forum, which will be held on September 11-13, are still being discussed. Hence, I cannot provide any information regarding the participation of foreign delegations. We will provide more details in August. Question: Azerbaijan will take over the chairmanship of the Organisation of the Black Sea Economic Cooperation (BSEC) on July 1. Deputy Foreign Minister of Russia Alexander Pankin attended a meeting of the BSEC Council of Ministers of Foreign Affairs yesterday. Can you comment on Azerbaijan’s upcoming BSEC chairmanship? What goals will Russia pursue in this period as a BSEC member state? Maria Zakharova: All of this was discussed at the meeting. Personally, I wish every success to Azerbaijan’s Chairmanship and Chairman-in-Office. We will provide constructive contributions to make the organisation’s performance really effective. In order to update the available information, I will gladly speak about Russia’s position on BSEC’s operation at a briefing, or we will publish a comment on the ministry’s website. Question: The Foreign Ministry of Azerbaijan has recently announced plans for an upcoming meeting between the foreign ministers of Azerbaijan and Armenia. What does Russia think about this? Maria Zakharova: We always say that representatives of the two countries in question should comment on such meetings. If such an event is coordinated and goes ahead, we hope it will be held in a positive atmosphere and will produce good results. We believe that this is what is needed to resolve the current problems, including in relations between these two countries. Question: State Duma Speaker Vyacheslav Volodin, who has recently visited Baku, said the following about the Nagorno-Karabakh problem: “Let us do all we can in this sphere and proceed from the assumption that those who try to sour relations have chosen the path which aggravates the situation. In this context, Azerbaijan has always held a correct and constructive stand. We hope that it will continue to do so.” How would you sum up Mr Volodin’s words about the “correct and constructive” stand of Azerbaijan in light of repeated threats to use military force to solve the problem made at all levels of power in the country? Does Mr Volodin’s statement imply that Armenia does not have a constructive position on the settlement, unlike Azerbaijan? Maria Zakharova: I would like to once again urge our colleagues from the Azerbaijani and Armenian media outlets to act constructively. We are aware of the increased attention given to each word uttered on this matter concerning Nagorno-Karabakh or either of the states involved. But I would like to say once again that the main thing is to act constructively when trying to deal with this problem, so as not to provoke the other side or fuel tension where one must act wisely to attain the main goal, which is to settle all affairs on the agenda. You know that I am saying this to all journalists regardless of which media outlet or country they represent. You also know about our traditional attitude to relations with Azerbaijan and Armenia and the Nagorno-Karabakh settlement. Our official position is fundamental and has not changed. We are working with both sides towards an acceptable result. We do not draw parallels between our role with the roles played by Baku or Yerevan, but this subject is really among our international priorities. A settlement based on binding agreements, coordinated positions as well as mutual respect between the sides would be definitely in our interests. Russia’s basic approach to this matter has not changed. It appears that politicians, various MPs, historians and journalists have made a great deal of statements on this topic. You know about our official position. I recommend that you always ask the speakers to explain what exactly they meant. In this particular case, I don’t think we should check the quotation to see if it was really what the speaker actually said. We really believe that the rhetoric of confrontation can only add fuel to confrontation. Of course, all parties made statements that have not complemented to an effective settlement of this problem. It would be useless to count them. The main goal in this respect is to prevent such non-constructive statements from interfering with the movement towards the common goal. Various representatives have made such statements in various formats. Unfortunately, many of them have been misquoted or quoted out of context, and then these misquotations are reposted. In this context and using this example, as well as taking into account the discussions we had in this room a week or two ago, I would like to say once again that it is best to rely on the official views. You know about them, and you know that Russia’s position on this matter remains unchanged. Let us be more accurate with quotations, and let us not try to complicate a situation that is already complicated as it is. I do urge you, as strongly as I can, to act constructively. Question: What do you think about US Secretary of State’s trip to Latin America during which he called for boycotting all actions undertaken by the governments of Venezuela and Nicaragua? Maria Zakharova: There would have been nothing unusual about these statements made by US officials had they been made five or seven years ago. I think that Latin American leaders have grown used to such statements made by the US. Situations or countries may change, but Washington has always had this attitude toward the region. This time is special however, given the ongoing debate taking place in the United States concerning interference in sovereign affairs. As far as we can see from the statements made by US politicians and the media who reflect what people think, the theoretical prospect of one sovereign country interfering in the affairs of another country is a very sensitive matter for the US. It is unclear though how these statements relate to one another. If the US opposes interference, why would it call for a boycott against Venezuela and Nicaragua? This would constitute an interference in the sovereign affairs of Venezuela and Nicaragua, and the entire Latin American region. Latin American countries have not vested the Department of State or the White House or any other US agencies with such authority. Let me reiterate that the question remains the same. You either cannot interfere in the life of other countries and regions, in which case you need to respect the processes taking place there, even if you dislike the leadership of these countries or their political views, or you can interfere. I think that Washington must choose. After all, we have been hearing at all levels for several years now that any interference in domestic affairs is unacceptable, while watching the US treat Latin America in such a heavy handed manner, using all the available means and possibilities precisely to interfere in domestic affairs. This does not make any sense, of course. A choice has to be made. Question: Russian journalists were prevented from attending an OSCE conference on the freedom of expression in Kiev. Could you comment on this incident? Maria Zakharova: We knew in advance that Ukraine was to host an OSCE-sponsored conference on “Strengthening media freedom and pluralism in Ukraine during times of conflict in and around the country.” Foreign Ministry experts who work on this topic immediately expressed their interest in attending the event. I do not recall mentioning this before, but it was clear the OSCE did not seek to make this conference truly inclusive or to engage all the interested parties in a constructive dialogue. Russia was interested in taking part in the conversation, which is quite understandable, since we knew all too well that otherwise the event will turn into yet another Russophobic gathering that will ignite passions within Ukraine. Seeking to steer the event towards constructive dialogue, the Foreign Ministry decided to send the head of the Information and Press Department to the event. A number of media outlets also expressed interest in attending, communicating directly with the OSCE. We transmitted all this information by diplomatic channels in due form. Let me clarify your question. You referred to Russian journalists. This may have the same meaning in English or Spanish, but takes on a different sense when said in Russian. We are talking here about Russian journalists, but not all of them are Russian nationals. For example, Yevgeny Primakov is a Russian citizen, while the RT journalist has a British passport. These journalists from RT and VGTRK were detained at the Kiev airport when the conference was about to open for some kind of interrogation, after which they were told to leave the country. It was even said that they would be prevented from entering the country for five years. All this took several hours. Really absurd things were written, alleging that these people were a security threat for Ukraine and interfered in domestic affairs, although it remains unclear in what way. There were even rumours that this was a provocation engineered by Russia, since these journalists had visited Crimea and had no doubt that they would be prevented from entering Ukraine, but came nonetheless. I instantly contacted Yevgeny Primakov and asked whether he had visited Crimea, and he told me that he had not, so Ukrainian officials should have had no reservations in this regard. He also told me that he made sure he was not subject to any entry bans before setting off for Kiev. This ban came into being upon his arrival to Ukraine. And all this was taking place against the backdrop of a debate on media freedoms in central Kiev. This is absurd! But this absurdity unfortunately dominates today’s Ukraine, and the OSCE contributes to this, to our deepest regret. This is all there is to say about this. We will not forget this. The Foreign Ministry will send letters to the OSCE describing in every detail what Russian journalists faced, and how the host country neglected OSCE standards and failed to provide for the attendance by all participants. The most horrible part was the debate that unfolded in the Ukrainian media and media community with some would-be journalists saying that Russian journalists should have been arrested in order to exchange them for someone later. These proposals came from people who pretended to be journalists on the very day that Kiev hosted an OSCE conference on media freedom. This is completely insane. And the worst thing is that there is nothing OSCE representatives could do, which showed their helplessness, weakness and dysfunction. Question: Lithuania’s Minister of Foreign Affairs Linas Linkevicius said at a meeting with his European counterparts in Luxembourg that the Russian Federation is the main source of a hybrid threat for the European Union. He suggested drafting an entire plan. Maria Zakharova: As I see it, only people with a hybrid mentality can say this. There is nothing else to add here. Indeed, this is already some kind of a meme. When they say that the main hybrid threat emanates from the Russian Federation, these people don’t understand that they are starting to spread a meme. This already sounds silly and strange. This is all I can say about this. Question: Do Russian television channels operating in the three Baltic states, including Lithuania, face any risks? Maria Zakharova: Unfortunately, we have been observing this trend for quite some time. This is not a new phenomenon, this took place long before the current situation emerged. By the way, when they start talking about this alleged hybrid threat, and that the situation in Ukraine and the events of 2013−2014 served as a “watershed,” I can say that this is absolutely not true. Regarding the three Baltic states, all this took place in the context of the situation around the Russian language in these countries. Ten years ago, they started encroaching on the Russian language and depriving Russian-speaking people of their rights. This had nothing to do with the situation in Ukraine. Everything proceeded its own way, and we repeatedly discussed this. This included discrimination against Russian language media outlets and Russian-language schools. These discussions have been dragging on for decades. Excuse me, but what can you say about the non-citizens and the concept of statelessness? Is this any better? Doesn’t this amount to what is happening to media outlets, that is, an absolutely discriminatory approach towards various groups allegedly conveying certain dissent, and, mind you, not in favour of some third party? They simply have their own viewpoint and their own history that they want to develop. I believe this issue should be examined in its entirety. This matter did not emerge only now, and certainly it did not emerge in 2013−2014, as everyone hints while making all these statements about a hybrid threat. All this began long ago and later spread to citizens. And now, this process has started openly affecting media outlets as well as journalists. Question: Do you expect any breakthrough at the upcoming summit when President of Russia Vladimir Putin and President of the United States Donald Trump are due to have a meeting? Some US media outlets, including CNBC television channel, claim that the US side will suggest that Russia help to put pressure on Iran in exchange for mitigating sanctions. Do you know the agenda of the meeting between US Secretary of State Mike Pompeo and Foreign Minister Sergey Lavrov? Will they touch upon important topics such as the problem of Palestine and missile attacks on the Gaza Strip, which are often ignored by media? Maria Zakharova: As you know, we don’t comment on summits because our functional duties are divided. This is within the remit of the Presidential Executive Office. I advise everyone not to use such terms as “landmark meetings,” “breakthroughs,” etc. I suggest treating these meetings in a pragmatic and realistic manner. Russian-US relations are long ripe for holding a number of meetings at various levels, as required by the bilateral agenda. First of all, I want to note that the bilateral agenda implies the interests of both countries’ citizens. Very many problems have accumulated, and we discuss them all the time. Therefore we need to build upon our relations in a realistic manner, while taking note of the agenda’s items. We discuss them on a regular basis. We still have no specific information about the Pompeo-Lavrov meeting because this event is currently being discussed. We will share any specific date or format, as soon as we get this information. This meeting’s agenda is quite impressive, including bilateral matters with all their problems, international affairs, Syria, the entire range subject to do with the Middle East and North Africa and the current state of the Palestinian-Israeli peace settlement that we are, unfortunately, witnessing. Other regional topics include the situation in Ukraine, international terrorism and many other issues that are usually discussed in such formats. I am not announcing these items, but I would like to stress that we discuss all these matters with our American colleagues, one way or another, in various formats. The sides might touch upon these subjects, if this meeting takes place. Question: US Principal Deputy Assistant Secretary of State Alice Wells has said recently that Washington expects Moscow to increase its support to Kabul. What do you make of this statement? Was the issue of Russian-US cooperation in the fight against terrorism in Afghanistan discussed during the recent visit of US National Security Adviser John Bolton to Moscow? Maria Zakharova: Presidential Aide Yury Ushakov commented in detail on the second question yesterday. As for your first question, what cooperation do you have in mind? Question: US Principal Deputy Assistant Secretary of State Alice Wells said that Washington expects Moscow to increase its support to Kabul. Maria Zakharova: Moscow should increase its support to Kabul? We can take decisions on relations between Russia and Afghanistan at our discretion. We are grateful to our American colleagues for making comments, but Russia’s statements and actions regarding Afghanistan indicate our desire to promote bilateral relations and settle regional issues, such as the fight against terrorism, cooperation at international organisations, and much more. Question: US Assistant Secretary of State for European and Eurasian Affairs Aaron Wess Mitchell said on June 26 that the United States was considering increasing the budget for military deliveries to Ukraine and Georgia. Allow me to quote him: “We are building up the means of self-defence for frontier states most directly threatened by Russia militarily: Ukraine and Georgia.” Can this statement and confrontational rhetoric be seen as a provocation and interference in the internal affairs of two sovereign states? Does this statement infringe on the principles and international standards of human rights, considering that Kiev does not honour the (agreed conditions of the) ceasefire in some areas? What other reasons can there be for weapons deliveries? Maria Zakharova: It is a question we have asked repeatedly. Why send weapons, if everyone, including in the United States, Ukraine and Canada, appears to stand for peace and compliance with the Minsk Agreements? The Minsk Agreements clearly stipulate quite different steps that have to be taken by each of the signatory parties. Regrettably, we see, on the one hand, that Kiev is not implementing its commitments under the Minsk Agreements, and that it has been acting in total disregard of them for years, and, on the other hand, weapons deliveries and statements and decisions to this effect taken in Western countries. I think you can see how this creates an atmosphere of support for the militant rhetoric we hear in Ukraine, which, regrettably, has long moved from mere words to active military operations. The worst part is that support has been promised to the segment of the Ukrainian political establishment that called for the use of military force and an increase in pressure, saying that the Minsk Agreements were expendable. I would like to remind you that this segment of the political establishment almost denounced President Poroshenko as a traitor for signing the Minsk Agreements. All this is serving the interests of and playing into the hands of those in the Ukrainian political establishment who uphold the nationalist ideology, and the president relies on these people. All this is being done to support these sentiments. We can see what this has led to. The world, including countries far away from Ukraine, is looking at the situation with a sinking heart. Many people have invested political capital there, including Chancellor of Germany Angela Merkel, who was personally involved in the drafting and contributed her ideas to these agreements. These people have invested their political capital in them. But their efforts have been brought to naught by Kiev’s neglect of its commitments, neglect which some Western politicians and officials support, as well as by weapons deliveries, which is evidence of backing for military solutions. Taken together, all these actions could lead to catastrophe, because they hinder the implementation of the Minsk Package of Measures, a practical and effective plan which was complied with for some time and which could be implemented. The international community has confirmed more than once and at different levels that this package remains topical and that there is no alternative to it. It can be implemented to the benefit of Ukraine and Ukrainian people, and them alone. But the recent actions are undermining the provisions of this package and the efforts of the international community to prepare and implement it by influencing, one way or another, the party that has pledged to honour its obligations. Question: EU leaders begin their talks in Brussels in just a few hours, and among other things, they will be considering whether to renew sanctions against Russia. This will be a regular meeting, held every six months, but this time Italy is expected to call for an easing of sanctions. I know that the Russian Foreign Ministry prefers not to engage in any dialogue on the lifting of sanctions with European countries, claiming that sanctions are illegal and groundless. Could it be that the time has come to launch this dialogue if Europe seems to be “waking up”? Maria Zakharova: And what would be the starting point of this dialogue? Did anyone engage in dialogue with Russia when introducing sanctions? It was a decision made by European Union countries under pressure from the United States. By the way, this may make you smile, but I recently travelled to France where I met with local experts on international relations and representatives of the Young Socialists movement. Many did not have the slightest idea that this was not a sovereign decision by France, in its national interests. They were not even aware of the pressure coming from Washington and Brussels. They were convinced that it was France’s sovereign decision. When I provided facts, it opened their eyes. How can we start a dialogue on an issue that was decided without any dialogue? After all, only they could make this decision. How can this be discussed? Today we received a letter from a French farmer who shared his story of how government policy was not only damaging for his business, but threatened its survival. He described all this in detail and sent this message to us, saying that he understood our position, but could not agree with that of France. This is a real letter, and I can show it to you. You think people over there do not understand this? I believe that the authorities should speak with their own people. We proceed from the premise that heads of state act in the interests of their people, while people over there send us letters saying that these actions put them on the brink of ruin. They do not even complain. I do not know why this letter was written, maybe it was simply a heart-felt emotional appeal. Question: Have you forwarded this letter to the French Foreign Ministry? Maria Zakharova: I think that the author could do it, if he wanted to. This is just one letter among a huge number of comments, letters and articles on this topic. During one of the conversations I had in Paris, I told one woman that they understood all too well that this decision was first and foremost at odds with their own interests. She recognised this, but said that France could not fail to respond to a “violation of international law by Russia.” I suggested that we avoid digging too much into history, and asked a question: if according to their logic Russia violated international law and faced sanctions for that, when will the US face sanctions, for example, for Iraq? Or when there will be sanctions against a number of countries involved in Yemen or against France for what happened in Libya? This startled her. This is absurd logic. How could a dialogue be possible? If you tell them that sanctions are bad for them, they know it already, but if you say that they are being pressured, it hurts their feelings. This is what I was told. Truth can be unpleasant at times. They know everything, and this is their decision. They were the ones who decided to impose sanctions, so it is up to them to think where it has led. The Russian Federation was not the one who developed this concept, but seeing what was happening Russia decided to benefit from the situation. You know this too. Question: Several days ago, the Secretary General of the Council of Europe stated that June 30 is the deadline for Russia to make its contribution to the CoE budget. Have there been any changes in Russia’s stance since only two days are left? Maria Zakharova: You know, there’s a popular saying, he who orders the music pays for it. We didn’t order any music, so what should we pay for? When there’s music, there will be money. This is a figure of speech. However, to be more specific, they are adult people. Did they not realise and still do not realise that unless Russia is reinstated as a full-fledged member of this organisation based on the corresponding documents and charters that they themselves had developed, nothing will happen? It was obvious, and was repeatedly mentioned. What kind of statements can be made now? What kind of ultimatums can be advanced? Question: Another football-related question, if you don’t mind. I’m sure you’ve been to Nikolskaya Street? Maria Zakharova: No, I haven’t. First, I was away on vacation during the first weeks of the championship. Then, there was much work to do, including related to the World Cup. I was in Samara, though, strolled down its streets and the embankment and saw vast numbers of fans (I posted photos on my page). I was stunned by what I saw there: the fans, the city that is completely ready for the event, and the central square given entirely to the fans. There were stages, cafes and first aid stations, one of which I was taken to for a tour. They told me stories related to providing medical assistance to foreign fans. However, what I liked most was the embankment. The sight was spectacular: the deep blue colour of the Volga River, bright sand and beautiful beaches. I was particularly struck by special amenities for people with disabilities at the wheelchair-friendly beaches. All of that was not built just for the World Cup, but it was the championship that made it possible to use these amenities in full measure, since all kinds of people come to the city, including people with disabilities. We walked around the city. The atmosphere was fantastic. I also have things to share with you. After I go to Nikolskaya Street, I'll tell you about my impressions, but the holiday spirit can be felt everywhere. There’s no need to go to any particular street. Question: Many issues were discussed during a recent visit by State Duma Speaker Vyacheslav Volodin to Baku, including Azerbaijan’s focus on the Russian language. Mr Volodin thanked the Azerbaijani leaders for the respect shown to the Russian language at the state level. He pointed out that no other country has so many Russian-speaking schools. What role, do you think, does the attitude of Russia’s neighbours to the Russian language play in maintaining constructive relations between Russia and them? Maria Zakharova: The attitude to the Russian language and the opportunities of the native Russian speakers, who used to live in one big country, the Soviet Union, and later found themselves nationals of sovereign countries, represents an important factor for Russia. The Russian leadership said so many times, and a number of specialised organisations, such as the Foreign Ministry, Federal Agency for the CIS, Compatriots Living Abroad, and International Cultural Cooperation, and other federal ministries and departments, engage in these matters. This is very important to us. We all remember well (well, unfortunately, not everyone, not perfectly and some don’t remember at all) the outcome of the referendum which decided the fate of the Soviet Union. Back then, the people argued in favour of keeping the union intact. However, life took a different turn. Not of their own will but contrary to it, people ended up living in different countries, but they accepted these states and began to work for their benefit. From the point of view of the people who lived at the turn of the century, it is normal to support people in their love and respect for their own culture and roots. At least, that is the foundation for Russia’s domestic and foreign policy which it is carrying out at international organisations specialising in these matters. For us, this is an important issue. We acknowledge the achievements of other countries on every occasion. Of course, Azerbaijan respects the rights of its Russian-speaking population. This coin has the reverse side, which is absolutely not the opposite. On the contrary, the thing is (let me express my personal viewpoint here) that this is good for the countries. The more languages the people speak, the more opportunities they have to self-actualise, especially when it comes to neighbouring states. After all, this is good for the countries that allow people to learn a foreign language, speak it, and use it in their work. This opens up great opportunities for financial, economic and cultural activities, such as to find work, to expand ties, etc. This process allows countries to enrich their population and the people who speak several languages, all the more so when the issue is about a neighbouring state which provides broad opportunities for cooperation and joint projects. Maria Zakharova: Here where? Known to you? Maria Zakharova: Then why are you saying things you know nothing about? Pardon me, but if you are saying that he is “known here,” then specify where and to whom. Have you read anything written by John Bolton? Go ahead and read. I really liked his book Surrender is Not an Option. It’s an interesting read. Why even ask a question, if you are just reading it off a piece of paper and have no idea what you're talking about? The meeting was constructive and laid the grounds for future contacts. It was dedicated to a dialogue on bilateral relations. It should be evaluated based on these premises. Question: Important presidential elections were held in Turkey, after which the country is about to change its structure and become a presidential republic. What kind of relations with the new presidential Turkey led by Erdogan should Russia expect? Maria Zakharova: We are building respectful and mutually beneficial relations with the new Turkey led by Erdogan based on the principles that are enshrined in bilateral documents.